DO Costers del Segre doesn’t see a lot of love in the press generally. It’s Catalonia’s most interior DO and is the only DO in the Lleida Province. Due to its geographic location, it’s often easy to overlook as all the other DOs are considerably closer to if not on the coastal regions. Founded in 1986, it’s a curious region as it isn’t contiguous and there are in fact six subzones: Artesa, Les Garrigues, Pallars Jussà, Raïmat, Segrià, and Valls del Riucorb. This diversity of zones has led to a great wealth of permitted grapes which for whites are: Macabeu, Xarel·lo, Parellada, Chardonnay, White Grenache, Riesling, Sauvignon Blanc, Moscatell d’Alexandria, Moscatell de Petite Grain, Malvasia, Gewürztraminer, and Albariño. For reds they’re more strict and allow: Grenache, Tempranillo, Cabernet Sauvignon, Merlot, Mourvèdre, Trepat, Carignan, Pinot Noir, and Syrah. While quite delicious and lighter-bodied wines have been emerging from the lower-elevation regions, the regions in the higher elevations have been producing extremely promising wines from what are typically regarded as very Northern French grapes such as Chardonnay, Pinot Noir, Syrah, and Merlot. The wine juggernaut Torres from Penedès, has planted a considerable number of hectares up around the village of Tremp at 900m as they see the forthcoming issues with Climate Change forcing them to grow grapes at higher elevations that were previously unsuitable for grape cultivation. 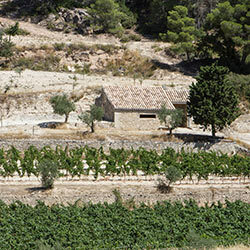 These diversities have led to it being difficult to define what exactly Costers del Segre “is” but the last decade has shown that despite the large differences, the region is able to produce quality wines that are decidedly different than what you see in the more coastal regions of Catalonia. Please peruse more articles about the wines of Costers del Segre.